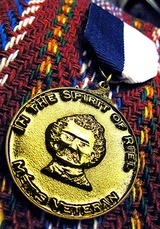 The Louis Riel medal was issued in 2009. The medal was issued by the Metis Nation of Ontario to citizens that were registered with the MNO and had self-identified as veteran. The medal was mailed to each recipient along with a letter from the president of the MNO. The medal is circular in form, made of pewter with gold plating, 1.625 inches (approx 42mm) in diameter. It was originaly issued in a swing mount format as per photo below. On the obverse, a bust of Louis Riel, with the inscription " In The Spirit of Louis Riel" at the top and "Metis Veteran" at the bottom. On the reverse, the inscription "In Memory of Louis Riel" at the top, the Metis Infinity sign in the middle, with a unique number in a rectangle, at the bottom. The top of the medal attaches to a ring. 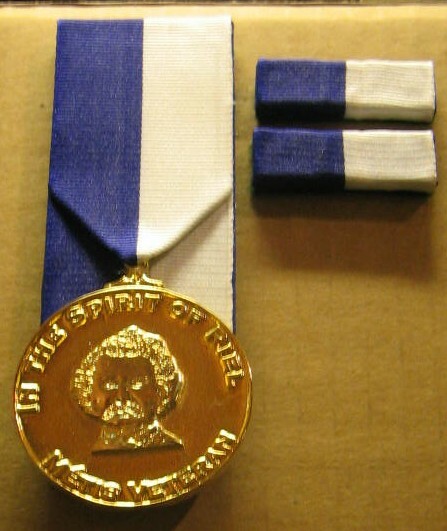 The ribbon is royal blue and white, divided 50/50, and 1.375 inches (approx 35.6mm) wide. The royal blue appears on the left and the white appears on the right. These were considered the colours of the blue Metis flag. There were no bars attached to this medal at time of issue. The medal is worn on the right side in the following manner. Over the right breast pocket, suspended by the ribbon described above (swing mount), or can also be worn as a court mount (shown below) on formal dress. Undress ribbons are worn just above the right shirt pocket (non-formal dress). The following medals are worn on the right side of dress uniform. The order of precedence as illustrated.